Twyla B. Baker-Demaray is the project director of the National Resource Center on Native American Aging. Baker-Demaray is also the principal investigator for the National Indigenous Elder Justice Initiative (NIEJI), both at the Center for Rural Health (CRH) at The University of North Dakota (UND) School of Medicine and Health Sciences (SMHS) in Grand Forks. Baker-Demaray has published her research on diabetes, cancer, and suicide prevention in academic journals and popularly. She is involved in groups such as the American Indian Science & Engineering Society, of which she is a Sequoyah Fellow and a member of the Board of Directors, and she is a Bush Foundation/Native Nations Institute Rebuilder Fellow. She was recently named a Native American Top 40 Under 40 honoree by the National Center for American Indian Enterprise Development. 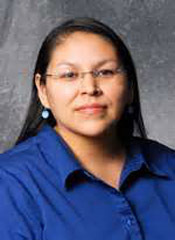 She is an enrolled member of the Mandan, Hidatsa, and Arikara Nation of Fort Berthold, and is originally from New Town, N.D. She holds a Bachelor of Science degree in environmental geology and technology and earned a Master of Science degree in education general studies, and a Ph.D in Teaching & Learning/research methodologies. She is a regular contributor to Lastrealindians, and Native Men’s Magazine.